Stop supplying the above batches listed above immediately. Quarantine all remaining stock and return it to your supplier using your supplier’s approved process. We do not anticipate any shortages of Irbesartan containing products. It is possible, however, that there may be some local supply issues, in which case patients should be advised to speak to their doctor to discuss alternative treatments. 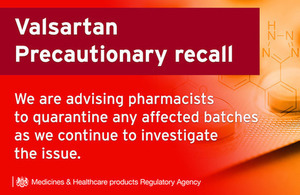 Pharmacies in the UK are being advised to recall all batches of valsartan containing medicines made by Actavis Group PTC (now Accord), Aptil Pharma Limited (now Torrent) and Dexcel Pharma Ltd due to contamination. Stop dispensing the products listed above immediately. Quarantine all remaining stock and return it to your supplier using your supplier’s approved process. An investigation into other potentially impacted products is currently being undertaken and further updates will be provided as the investigation progresses. Class 2 Medicines Recall:Own-brand children’s glycerine and blackcurrant cough syrups manufactured by Bell, Sons & Co.
Bell, Sons & Co is recalling several batches of own-brand children’s blackcurrant cough syrups due to a small number of reports of mould. Bell, Sons & Co (Bells) is recalling 15 batches of the cough syrups listed above to patient-level as a precautionary measure due to a small number of reports of mould. This Drug Alert is provided to healthcare professionals for information in case you receive any queries or ADRs relating to this issue. This is a GSL product which has been sold from the retail shops Tesco, Asda, Wilkos, Sainsbury, Morrisons, Superdrug in the retailer’s livery and one pharmacy chain (Numark, in Numark livery). It has also been supplied in Bell, Sons & Co livery to Poundstretcher and to a number of wholesalers. 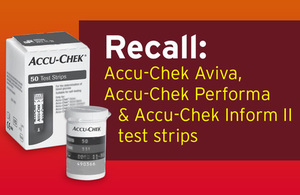 All retailers and wholesale customers have been notified and stock is already being recalled at store level. Patients are being asked to return bottles from the above batches to the shop they bought it from. At the time of writing the MHRA has not received any reports of ADRs relating to this issue. The mould has been identified as Penicillium decumbens, Penicillium corylophilum and Penicillium brevicompactum. Although these moulds may be inactivated in the stomach, there is a low potential risk of systemic infection in younger or immunocompromised children, causing symptoms of infection such as fever. Penicillium brevicompactum and Penicillium corylophilum can produce mycotoxins. Reactions to these mycotoxins are rare in reported literature but there is a low risk they could induce non-specific toxin reactions that could include rashes, breathing difficulties and Gastro-Intestinal (GI) symptoms. There is also a low risk of allergen-mediated disease either through inhalation or ingestion of Penicillium antigens to occur, causing allergic symptoms. Please quarantine and return all stock of this product to your supplier as per the instructions provided by Bell, Sons & Co If your customers return stock to you, please return it to your supplier. It is important for people to check if they have any bottles from the batches of the blackcurrant cough syrups listed above. If they do, they should not take them or give them to others. They should return any bottles of the batches above to the shop or pharmacy they bought it from. The mould is not always visible so they should return any bottles of the cough syrups from the batches above even if they can’t see the mould. Whilst the possibility of a reaction to the mould is low, if parents are concerned their child has had a reaction they should speak to their GP, pharmacist or other healthcare professional. As with any medicine, we strongly encourage anyone to report any suspected side effects to the MHRA via the Yellow Card Scheme.